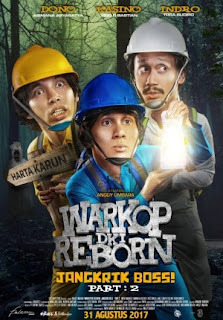 Last night, I had the chance to go and see the premiere of the highly anticipated sequel of that crazy funny movie in 2016 Warkop DKI Reborn: Jangkrik Boss Part 1. I was very fortunate that despite advance tickets sale available since more than a week ago, due to the high demand, the cinema chains added some more studios to show the movie which happened to be opened only yesterday. So in the morning my wife immediately bought the tickets for the 7.30 PM show. Well without further ado, let us move on to the movie. The movie started with some flashbacks from the first part to remind us how our favorite trio Dono (Abimana Aryasatya - Negeri Van Oranje, Sabtu Bersama Bapak etc), Kasino (Vino G. Bastian - 30 Hari Mencari Cinta, Bangkit etc) and Indro (Tora Sudiro - Arisan!, 3 Dara etc) plus Sophie (Hannah Al Rashid - Critical Eleven, Jailangkung etc) were in Malaysia to do a treasure hunt. They were unable to continue their search due to the map that was put in their bag was accidentally taken by a lady in red in the airport. After some real crazy funny stunts involving a fierce librarian and a mad scientist, finally they managed to find that lady who was later on revealed to be named Nadia (Malaysian actress Nur Fazura - Bulan Terbelah di Langit Amerika, Rafathar etc). Kasino immediately felt interested in Nadia and tried various ways to be close to her. So when they realized that in order to go to the treasure location they needed someone who knew about Malaysia's remote places, Kasino did not hesitate and asked her to accompany them. This would be the time where all crazy things would happen till the end of the movie. So could Dono, Kasino and Indro find the treasure? Could they settled the punishment they received in the first part? Find them all in this absurd slapstick fun comedy movie. Well, when watching a movie with this trio, you certainly have to throw all the logics from your brain and just enjoy the entire fun parts as they are. This time, the director Anggy Umbara did not change the formula that made the movie so successful like in the original movie where the slapstick humors were apparent to see. However, if you compare the smart satires, this sequel seemed to be having too little to my liking. Some of the jokes now did not feel as good as the first movie, but nevertheless they still were funny and we still managed to have good amount of laughs. I also found that in this sequel, the story strayed too much from the main plot, and it became too weird to my taste, particularly during the latter part of the treasure hunt scene when a new character appeared. However, the funniest part of the movie was shown during one of those scenes where my wife and I found ourselves to be laughing the hardest then. It was sooo funny and I guarantee that you would also feel the same way as we did then. The part where I felt was too weird in the first movie, i.e. the appearance of future Indro (played by the original Indro) still made me feel the same here, although to be fair there was 1 moment that his appearance was very fun to watch (the scene in the beach). As for characterization, I very much enjoyed Abimana, Vino and Tora's portrayal just like in the original movie. They were really believable as the real Dono, Kasino and even Indro. Even their voices sounded similar. I have mentioned in my review of the first movie that it would break the records of movie audience and it did. This time the movie did break the record for the most people watching on its first day. Whether it would break the record of audience remained to be seen. For other characters though, unlike Tarzan in the first movie, there really was no outstanding performance that caught the eye. The movie was becoming too heavily reliant on the power of the trio which was rather shame. Overall, in my personal opinion, I believed the original movie (perhaps due to its hype or our longing to see Dono Kasino and Indro again) had a rather superior feeling if we compared with this second one. This movie felt it had too much unnecessary scene and as I said above, it strayed too much from the main plot plus the twist that felt forced. However, the jokes, the funny and absurd parts, and some vulgar jokes a la classic Warkop DKI movies were still available for those who loved them. My wife and I and the rest of the audience still enjoyed the jokes. And do not forget the funny bloopers during the end credit scene which definitely gave us a lot to laugh as well. So if you want to be a part of the general audience who have already seen this movie since yesterday, then hey, go ahead and flock the theaters near you. But do not expect this one to be a much better movie than the original one or having more political & smart satires. Just sit back, relax, go with the flow and enjoy!